Irving G. Tragen lived at I-House from 1943-1947 while he attended UC Berkeley to obtain his B.A. degree and later to receive his J.D. at the Berkeley School of Law. He met his wife, Eleanor Dodson, while he was living at I-House. His Foreign Service began in 1948 in Mexico, followed by three years at the Pan-American Sanitary Bureau. He entered the US Foreign Assistance Program in El Salvador, followed by assignments in Chile and Peru. From 1960 to 1980, in the US Foreign Service, he had many varied assignments including Labor Attache to Venezuela; Labor Advisor for the Alliance for Progress (AFP); Director of the AFP Office of Institutional Development; AID Director in Bolivia; Director of Argentina, Paraguay and Uruguay Affairs; Vice President of the Inter-American Foundation; Director of the Regional Office for Central American Programs (ROCAP); Economic Counselor and USAID Director in Panama during the Panama Canal negotiations; and, Deputy Chief of the US Mission to the Organization of American States (OAS), with rank of Ambassador when heading US delegations to OAS specialized conferences. In July 1980, he joined the OAS Economic and Social Secretariat. In late 1984, he was named advisor to the Secretary-General on Inter-American Narcotic Drug Trafficking, which led to the creation of the Inter-American Drug Abuse Control Commission (CICAD) and his appointment as its first Executive Director in 1988. He retired at the end of 1994. To learn more about his life and career, please click here. How clean is your power grid? The answer changes every five minutes. From smart thermostats to industrial-scale chillers, the world’s 20 billion smart devices now account for a rapidly growing share of all electricity consumption on Earth. Every one of those devices is now capable of automatically powering itself partly through renewable energy, thanks to a new technology called Automated Emissions Reduction (AER). AER was invented by WattTime, a tech startup founded at UC Berkeley by a group of students. Many of those students were International House residents, and many of the early work on AER was done in I-House’s Great Hall. The story of WattTime’s founding is in many ways the story of I-House: bringing together people from diverse backgrounds in pursuit of a common goal. And WattTime’s ongoing contributions have continued to mirror this diversity: unlike most tech startups, which emphasize innovation in software, WattTime’s broad range of talent has led to cutting-edge breakthroughs in an unusually wide variety of fields, including machine learning, finance, accounting, statistics, law, engineering, and public policy — all in service of a more sustainable world. And our story only could have unfolded at a place like I-House. Gala ticket registration ends at 5:00 PM on Thursday, April 5th, so it’s not too late to join us for a special evening. Learn more at ihouse.berkeley.edu/gala. 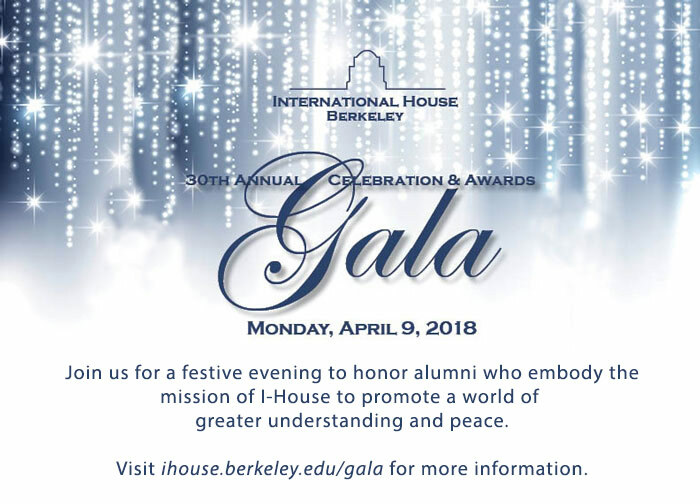 To reserve Gala raffle tickets, please visit ihouse.berkeley.edu/galaraffle or contact us at 510.642.4128 or ihalumni@berkeley.edu.